My husband and I were recently in Grand Rapids and had dinner at a phenomenally original restaurant, Reserve. As I debated between the hogs cheeks and salmon with chicken liver sauce, our dining companions recommended we accompany our meal, not with the expected bottle of wine, but with a bottle of Dragon’s Milk. The waitress concurred and said it would be marvelous with the hogs cheeks and field peas I planned to order (raised in Alabama, this is comfort food for me). It’s an ale constructed at New Holland Brewing in Holland, Mich. The back label describes it as “A barrel-aged stout with roasty malt character intermingled with deep vanilla tones, all dancing in an oak bath.” It recommends being paired with red meat, smoked foods, balsamic, rich cheese and dark chocolate. The man, a fan of the Great Lakes, plans to retire one of these years in Michigan. Who wouldn’t? Especially with a mug of Dragon’s Milk to ease the pain of aging. Another friend said it wasn’t her “cup of tea.” Unlike the two of us, she didn’t like the slight bitter flavor of the rich brew paired with the ice cream. For me, a Dragon’s Milk float is like savoring life; the bitter and the sweet. P.S. The floats look really sharp served in margarita or martini glasses. Mound scoops on vanilla ice cream in bowls or glasses. 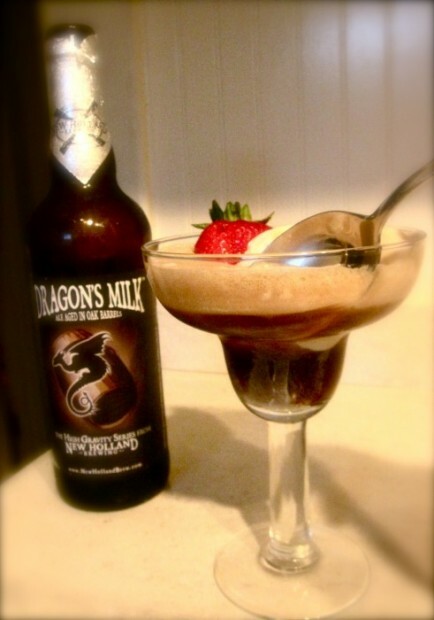 Carefully divide and pour Dragon’s Milk over ice cream. (Pour slowly off to the lip of the glass. Dragon’s Milk is quite foamy.) Garnish with strawberry fans, if using, and serve.